After a severe storm, many homeowners wonder "Can my trees be saved?" Trees have an amazing ability to recover from storm damage. Hasty decisions can often result in removing trees that could have been saved. 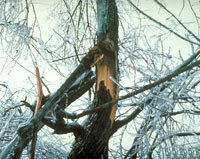 Follow these simple steps for dealing with damaged trees after a storm. Approach damaged trees with extreme caution—stay clear of downed wires and call 911. Other than the storm damage, is the tree healthy and vigorous? If the tree is healthy, is not creating a hazard, and did not suffer major structural damage, it will generally recover if you take first aid measures immediately. The larger a broken limb, the harder it will be for the tree to recover from the damage. 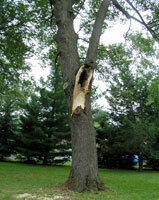 If most of the main branches are gone, the tree may have little chance of surviving and removal should be considered. Has the leader, the main upward-trending branch, been lost? In species where a leader is important to upward growth or desirable appearance, it's a judgment call. The tree may live without its leader, but it will be stunted or deformed. Is at least 50 percent of the tree's crown (branches and leaves) still intact? This is a good rule of thumb on tree survivability. A tree with less than half of its branches remaining may not be able to produce enough food to survive another season. Removal should be considered. Larger wounds are less likely to heal, leaving the tree vulnerable to disease and insects. A 2- to 3-inch wound on a 12-inch diameter limb will seal over with new wood and bark within a couple of years. Can remaining branches replace the missing branches? 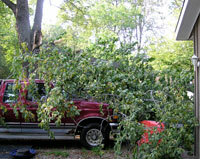 Some of your trees may have hidden damage or damage that's too close to call. 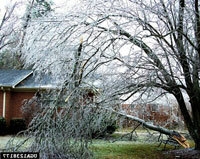 In such cases, you may need a tree professional to help you decide what to do. Don't hire just anyone who shows up at your door following a storm. Look for a qualified arborists or contact your city forester.